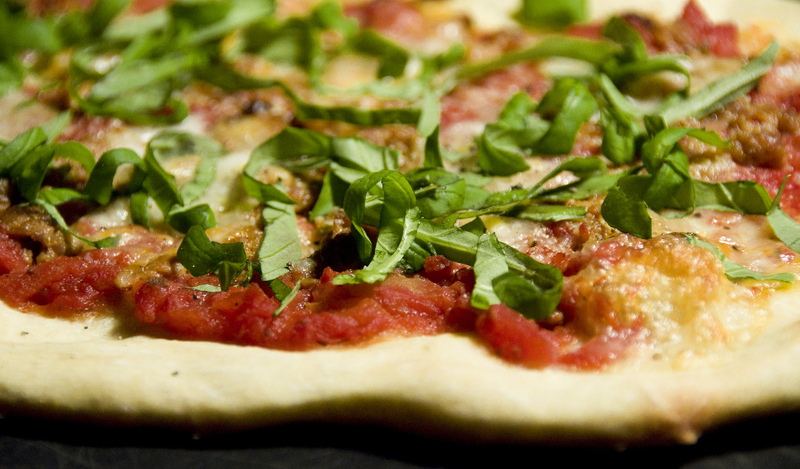 Mmm… is there anything better than homemade pizza fresh out of the oven? Pizza is easy to make, the toppings are fun to experiment with, and the results are tasty and rewarding. For me, the one problem with pizza is that I only like to use Trader Joe’s fresh pizza dough which means that I can only make pizza once or twice a month after we visit TJ’s. We used to live within walking distance of a Trader Joe’s but now a 20 minute drive (and bad rush hour traffic!) separates us from my favorite dough. 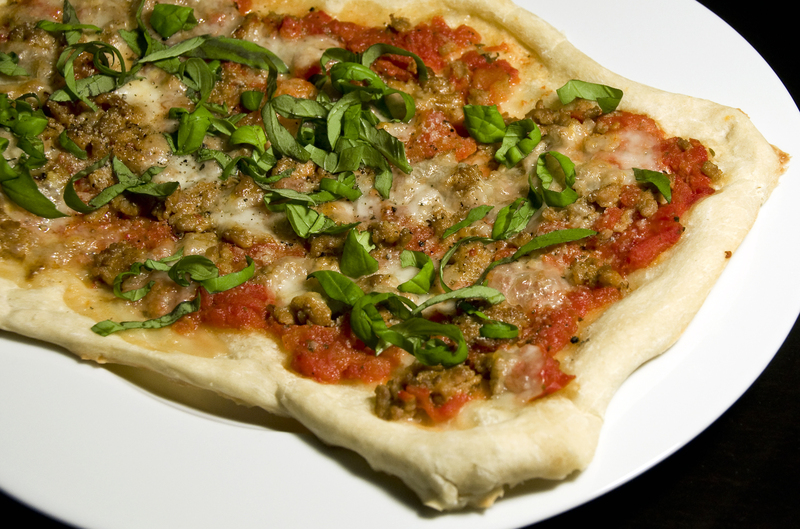 I have tried the pizza dough from Whole Foods and, although it isn’t bad, it simply can’t compare with the crispy, chewy flavor of the dough from Joe’s. So, as you might have guessed, we stopped by Trader Joe’s over the weekend and I picked up a bag of dough. We already had some hot Italian turkey sausage and basil so I decided to make a Sausage Tomato Basil Mozzarella (TBM) pizza for dinner last night. A note about the cheese… TJ’s was sold out of the marinated mozzarella balls that I typically buy so I tried their Ciliegine mozzarella which is billed as stringier, softer, and more authentic. More authentic it may be but it also was much more watery and seemed to melt into nothingness on these pizzas. Next time I’ll hold out for the good mozzarella! Crumble and brown the turkey sausage in a large frying pan or wok. When the sausage is nicely browned, remove it from heat and set aside. Drain the diced tomatoes slightly and then saute over medium heat for 10-15 minutes to reduce. If you want a smoother tomato base, use a potato masher to slightly crush the tomato chunks. Meanwhile, stretch out your pizza dough into two rectangular pies on a large cookie sheet (see my Homemade TBM Pizza for instructions on how to do this). Bake pizzas in a preheated 350° oven for 12 minutes. Remove the pizzas from the oven and top with your sliced basil. Enjoy! When I make pizza at home, one of my favorite toppings is simply strips of ripe avocado, cut from top to bottom, one per slice of pizza. Just put them on after removing it from the oven! Hi Dave! No, I’ve never tried their wheat dough. I think Matt’s mom uses their Herbed Dough (which I guess is just the white dough with herbs??) but I’ve never baked it myself. Your pizza sounds great, I’ll have to try it sometime!